Creating a relaxing and beautiful outdoor space for your clients is important for the spring and summer months. Everyone wants to spend their time outdoors, soaking up some much needed sun. Give your interior decorating clients an area to be proud of, a place where they can invite family and friends to relax in! Here are some simple ways to create a welcoming and enjoyable outdoor space for your clients to lounge in all summer long! A super simple and cute way to take your client’s outdoor décor to the next level: vintage accessories. These can come in the form of vintage-styled flower pots, wrought-iron coffee tables, or our personal favorite—the repurposed bicycle! How do you achieve this vintage-inspired look? All you need to do is head out to some local boutiques and thrift shops, and find an old bicycle that has outlived its use. Then, you can start your handy work! Add a basket to the front of the bike and replace the seat with a basket as well. Add in your soil and plant food, and your choice of flower arrangement. Let your mini garden grow and voila! A perfectly vintage lawn accessory. Although you can buy these in home décor stores, it’s way more fun to create your own! The only thing we advise: do not try to cut down your own tree for this project! How to create it: start by finding an existing tree stump, or get one by heading to your local yard trimming disposal area, and be sure to clean out as much dirt as possible. Continue by sanding the dry stump all over the outer layer. Once you get an even finish, you can decide if you want to add your own sealant or stain to protect the wood. Make sure that the top and bottom of your stump table is flat—you don’t want a wobbly table! Just as well, this is definitely a table you’ll only want to use outside. You are using it straight out of nature, after all! Super easy and attractive, this is probably the easiest outdoor project you’ll add to your client’s garden. Simply find some old or unused watering cans or steel buckets, and use them as flower pots! You can amp up the look of them by adding bright colored paint, or creating a cool design on them. Once you’re happy with the look of your DIY flower pot, add your soil and seeds. Let your flowers grow for a beautiful addition to any garden or patio! If your clients enjoy having friends and family over for summer BBQs, this is definitely a DIY project to get started on! Creating a chalkboard is a fancy addition to any BBQ décor, where your clients can list their menu or simply welcome guests to their home. Whether you want to use an existing easel or build your own, you can create a chalkboard with chalkboard paint. You’ll want to use a smooth, hard surface for the board piece so it’s easy to write on. To amp up your chalkboard, paint the stand or frame with a brightly-colored paint to channel summer vibes to your client’s outdoor space. If your clients aren’t too keen on maintaining a garden, but still want an added touch to their front lawn, use this easy DIY idea. Create a small area for a garden (if one doesn’t already exist) and use some low-maintenance plants. Once you have your plants placed and safe in the soil, grab garden pebbles from your local outdoor home store and layer them over the soil. You’ll want enough to cover every bit of soil—this will create a smooth, clean garden with beautiful plants growing on their own. Disclaimer: Your clients may need to water their garden occasionally, but it takes the mess out of dealing with soil! If your clients don’t yet have a pathway leading through their garden or lawn, consider adding a simple stepping stone path for a secret garden look. Building a complete lawn path can be a big project, so we have a quick fix that will make your client’s outdoor space look unique. Decide on which kind of stones your client wants to use, and choose which area of the garden you’ll want to add them. This project is simple because, if the stones are heavier, you can place and go! Strategically place the stones an equal distance away from each other, leading to a certain area of the lawn. You can create a path leading to a bench, barbecue, or even a bird bath. This will make the lawn look less bare and more inviting! When it comes to DIY home décor, you’ll need to channel some creativity to make each project your own. DIY is all about unique ideas and designs, so choose your favorite outdoor décor and brainstorm your own version! 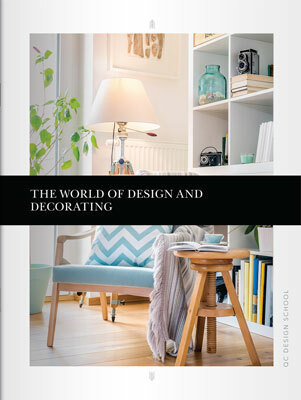 Inspired to start your décor career? Check out more ideas for outdoor décor and creating the perfect space!